UN senior official Manfred Nowak said private interviews were a "totally non-negotiable pre-condition" for conducting the visit. Mr Nowak, the UN's special rapporteur on torture, told the BBC his team would accept nothing less than unfettered access. "If you want to hear from a detainee or know from a detainee whether he or she has been subjected to torture or ill treatment then you must be allowed to speak to this person in private," he said. "In front of prison guards they would never tell you the truth because of being afraid of reprisal. "There are certain conditions which we feel are non-negotiable and unannounced visit to places of detention and private interviews with detainees is one of those totally non-negotiable pre-conditions." Only the International Committee of the Red Cross has been given access to the prisoners. It reports its findings only to the detaining authorities. 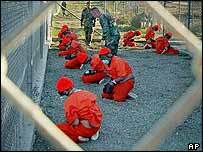 Human rights campaigners have expressed growing concern about the treatment of the inmates at Guantanamo, a number of whom are on hunger strike. Calls for it to be opened to human rights monitors increased this year, as more allegations surfaced of abuse at the prison camp. UN officials have been trying to visit the camp since it opened in January 2002. Last month, the Pentagon said the UN monitors would be allowed to visit the camp on 6 December. Pentagon spokesman Lieut Col Brian Maker told the BBC the invitation to the UN team was intended to allay fears that detainees were being mistreated.